Everyone gets angry. And in a turbulent economy where finances are stretched, property prices waver and unemployment booms, blowing a fuse is par for the course. But you don't have to take it out on others! 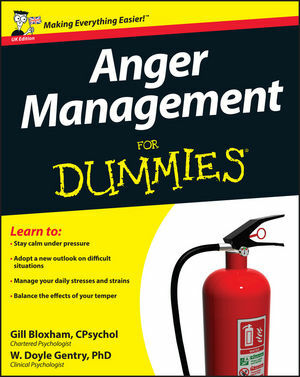 Anger Management For Dummies, UK Edition shows you how to work through feelings of rage, emerge from the red mist, and lead a healthier, happier and more positive life. This fully adapted UK edition guides you through ways to recognise and deal with the underlying causes of anger at work, in relationships and in your personal life - and teaches you how to stay positive in spite of all the stresses and strains life throws your way. From letting go of resentments, preventing new rage and dealing with the anger of others, to improving self-expression, honing spiritual calm and getting a good night's sleep, this user-friendly guide tackles the latest anger-busting exercises and therapies (including CBT) and demonstrates how to deal with anger constructively. Gill Bloxham, CPsychol is a Chartered Psychologist and an Associate Fellow of the British Psychological Society. Gill teaches on university courses, to charity organisations such as MIND and to non-health agencies including the police and local government.W. Doyle Gentry, PhD, is a Clinical Psychologist and Director of the Institute for Anger-Free Living. Part I: The Basics of Anger. Chapter 1: Anger: A Natural Human Emotion. Chapter 2: When Is Anger a Problem? Assessing and Understanding Your Anger. Chapter 3: Is Anger Damaging Your Life? Part II: Dealing with Past and Present Anger. Chapter 4: Taking Immediate Action. Chapter 5: Avoiding Speaking Out in Anger. Chapter 6: Keeping Your Cool. Chapter 7: Letting Go of Past Anger. Chapter 8: Moving Forward: The Power of Forgiveness. Part III: Preventing Future Anger. Chapter 9: Adopting a New Outlook. Chapter 10: Saying What You Mean. Chapter 11: Owning Up to Your Anger. Chapter 12: Balancing the Effects of Your Temperament. Chapter 13: Using Anger Constructively. Part IV: Lifestyle Changes That Improve Your Anger and Health. Chapter 14: Managing Daily Stresses. Chapter 15: Managing Your Body Chemistry. Chapter 16: Getting a Good Night’s Sleep. Chapter 17: Looking After Your Spiritual Health. Chapter 18: Staying in a Good Mood. Part V: Managing Anger in Relationships. Chapter 20: At Home and In Intimate Relationships. Chapter 21: Ten Ways to Raise a Child to Have Healthy Anger Control. Chapter 22: Ten Anger-Freeing Thoughts. Chapter 23: Ten Anger-Freeing Actions.